Average sold price was $440,702 for detached single family (DSF) – a new record high – and held steady at $285,584 for attached single family (ASF) homes, up 9 percent and 12 percent, respectively, compared to a year ago. Buyers received some good news as inventory significantly increased compared to the prior month and days on market (DOM) rose to 31 and 30 days for DSF and ASF, respectively. Active listings are significantly lower: The number of active listings has a significant impact on price, and in 2007, there were more than 30,000 active listings. Today, active listings currently sit at just under 4,400. Average DOM has dropped: The average DOM is 31 days, down 67 percent compared to 2007. Flash sales have increased: The number of flash sales – where properties go under contract in seven days or less – was less than 10 percent of all sales in 2007. In our current market, flash sales are more than 60 percent. Inventory is moving up: The number of closed transactions for homes under $200,000 is down more than 70 percent, while home sales between $400,000 and $800,000 are up more than 100 percent. 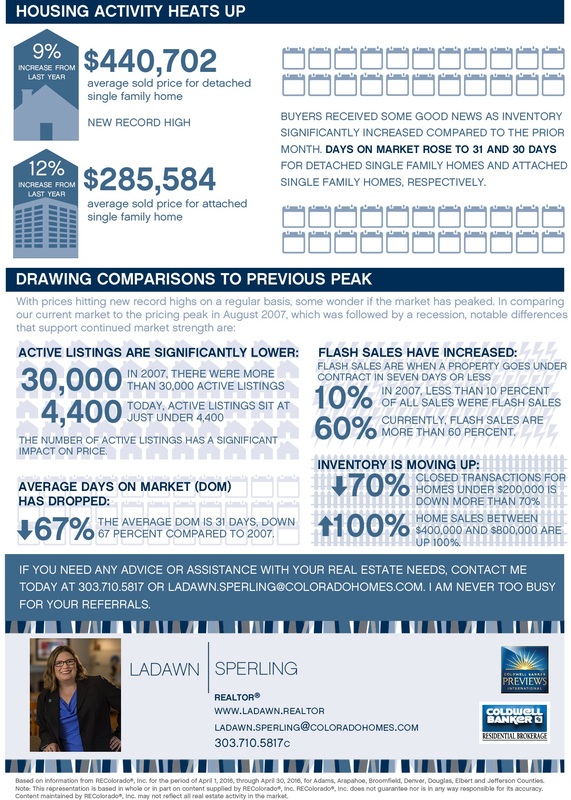 Based on information provided by Land Title from REColorado®, Inc. for the period of April 1, 2016, through April 30, 2016, for Adams, Arapahoe, Broomfield, Denver, Douglas, Elbert and Jefferson Counties. Note: This representation is based in whole or in part on content supplied by REColorado®, Inc. REColorado®, Inc. does not guarantee nor is in any way responsible for its accuracy. Content maintained by REColorado®, Inc. may not reflect all real estate activity in the market.